Vacuuming with a Miele, floor to ceiling, for a customer with asthma. Check out how I choose vacuums for my services. Exclusively for customers detoxing their homes. Please note: I’m fully booked at this time. I’ve helped customers breathe easier since 1985 by launching one of the first health-based cleaning services in the U.S. That means deep, detailed cleaning, using the least-toxic cleaning products that work. Customers with allergies, asthma and chemical sensitivities have long relied on my services for eliminating triggers. Now, increasingly, I’m helping customers detox their homes. And creating conditions for efficient, toxic-free cleaning. And really, this was my ultimate mission from the start! Simplifying and detoxing your cleaning supplies. Minimizing sources of toxic house dust. Weeding out any clutter getting in the way of safe, efficient cleaning. Deep, detailed cleaning. Safely and efficiently. I can help you find the least-toxic cleaners that will work in your home, cost-effectively. Most house dust is contaminated with toxic chemicals shed by common household items. Among the most worrying are endocrine-disruptors. Examples are flame retardants and synthetic fabric dyes. You and your loved ones are likely exposed, day in and day out. I can help you find sources of flame retardants in your home— like upholstery, carpet padding and more. And following the Precautionary Principle, help you phase them out. Cost-effectively. If you have other air quality concerns, or questions about water or soil quality, go to the next level. Contact Healthy Building Science, leading environmental professionals in the San Francisco Bay Area. Cleaning is extra time-consuming in a cluttered space. That means less cleaning gets done. And much important cleaning never gets done. Even a highly organized space can be cluttered, creating a road block to efficient cleaning. The idea is having less stuff to clean in the first place. Therefore, less need for cleaning services at all! Together we’ll de-clutter one or two small areas per session, depending on how much stuff there is. And I’ll follow-up with a thorough cleaning. Some customers do the de-cluttering step themselves, with my suggestions on what will streamline cleaning. 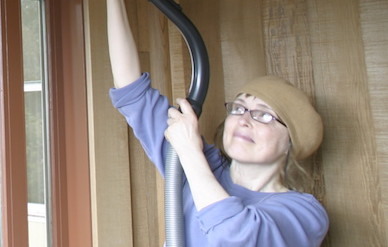 Cleaning— deeply, safely and efficiently. Once your home’s free of toxic hazards and clutter, it can be cleaned safely and efficiently. Using a customizable prioritizing list, I can help you with the following. Detailing, focusing mainly on dust, using your healthy vacuum. In contrast, most other services focus mainly on the kitchen and bathroom, and only cosmetically remove dust. So my service is a perfect complement to the service you likely already use. Light kitchen and bathroom cleaning, using the least-toxic products that work. Please detail your needs. Your personal information won’t be shared or published.